PeaceLoveMom is everywhere - even in Germany! Hello. I am a big fan, and wanted to share a Thanksgiving Day picture in my PLM "Grateful" Mom t-shirt. I made sure I wore my shirt on Turkey Day, especially since we were in Germany for the week. So much for which to be grateful! 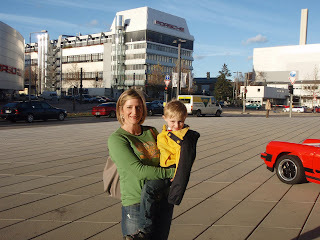 This is a picture of me and my son William in front of the Porsche Museum and Factory in Stuttgart, Germany. Thanks for making such fun products!